= Maggie Sensei toka iu inu shitteru? = Do you know a dog called Maggie sensei or something? Today’s guest teacher is Ella-sensei. She is a one-year-old Norwegian Forest Cat. According to her sister, Ella is a very cheerful kitten and is always running around the house. She also loves sleeping and wakes up with 寝癖 ( = neguse) bed head. = Soredewa Ella Sensei yoroshiku onegai shimasu. = OK, please start the lesson, Ella-Sensei!! = Minasan, hajimemashite! Ella desu. = Nice to meet you, everyone! I’m Ella. My sister told me to help Maggie Sensei today. But to be honest, I don’t know who she is. I will include some casual usages that you may not find in your textbooks. 1) When you list (the same kind of) multiple things. = Osushi toka tenpura toka ga demasu. = They will serve you sushi, tenpura and so on. = Kare no appato wa, kitanai toka samui toka monku bakari itte ita. = He kept complaining, saying things like that apartment was dirty or too cold and so on. = Yaru toka yaranai toka wa ato kara kimete kudasai. = You can decide whether you will do it or not and so on later. = Oishii toka mazui toka iwanai dene. = Don’t criticize saying things like it’s delicious or bad. = Tokyo ni ittara Harakujuku toka Ameyoko toka ni itte mitai. = When I go visit Tokyo, I would like to go to the places like Harajuku or Ameryoko. = Eki no baiten niwa osushi toka nihon cha toka ga utteimasu. = They sell things like Sushi and Japanese tea at stalls in the station. = Donna ongaku wo itsumo kiite iruno? = What kind of music do you usually listen to? = J-pop toka geimu ongaku toka kiiteruyo. = I usually listen to the music such as J-pop, game music and etc. = Aisukuriimu to ka keeki toka ga tabetai. = I would love to eat sweet things such as ice cream or cake. You sometimes just use one とか ( = toka) in conversation. = Aisukuriimu toka keeki ga tabetai. = I want to eat something like ice cream or cake. = I want to eat something like ice cream. = Aisukuriimu to keeki ga tabetai. = I want to eat ice cream and cake. The difference: The speaker wants two specific things. Ice cream and cake. That’s it. things like ~, A and/or B, etc. = Aisukuriimu ya keeki ga tabetai. = I want to eat ice cream and cake, etc. = Aisukuriimu ya keeki ga tabetai desu. = I would like to eat something like ice cream or cake. (1) とか ( = toka) is more conversational than や ( = ya) or など ( = nado) . (2) You don’t repeat や ( = ya) and など ( = nado) twice. = Ringo ya orenji ga sukidesu. = Rigo nado orenji nado ga suki desu. = Ringo ya orenji (nado) ga suki desu. 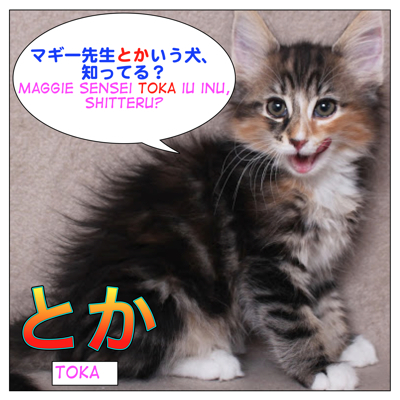 (3) While you use とか ( = toka) with verbs or adjective, you only や ( = ya) with nouns. = Wakaranai kotoba ga attara, jisho wo hiku toka sensei ni kiku toka sureba iinoni. = If there is a word that you don’t know, you should just check the meaning in your dictionary or ask your teacher. = Wakaranai kotoba ga attara jisho wo hiitari sensei ni kiitari sureba iinoni. Note: Ex.1) and 2) mean the same thing. = Yasumi no hi wa sanpo shitari hon wo yondari shiteimasu. = I spend my day-off going for a walk, reading a book, etc. = Yasumi no hi wa sanpo (wo suru) toka hon wo yomu toka shiteimasu. and again とか ( = toka) is more casual/conversational. I have a lesson on たり　( = tari) so if you want to learn more, go check the lesson. 2) When you quote what someone said. = Souieba, kare wa mou koko niwa konai toka itte itanaa. = Speaking of which, he told me something like he wouldn’t come back here anymore. = Nihongo wa mou benkyou shitaku nai toka iwanai deyo. = Don’t say things like you don’t want to study Japanese anymore. = Mou kanojo no koto wa aishite nai toka icchatterukedo hontou wa mada sukinan janai? = You say something like you don’t love her anymore but I bet you still like her. = Toka nantoka icchatte, hontou wa mada sukinan janaino? = That’s what you said but you still have feelings for her, don’t you? You suggest plausible possibilities or reasons in a subtle way. = He is late, isn’t he? = Maybe he slept late or something. = Ella, saikin ureshisou dane. Kareshi ga dekita toka. = Ella, you look happy lately. You got a boyfriend or something? = You look skinny. What’s going on? Don’t tell me, are you in love or something? This とか (=toka) doesn’t have any specific meaning but has functions as a way to soften the tone of one’s speech in some cases. By adding とか (=toka), you can express something not too directly. Young people especially tend to use this kind of とか ( = toka). E. 明日、暇？ = Ashita hima? = Are you free tomorrow (or something)? Note: By adding とか ( = toka), it gives less pressure to the listener. = Do you have slippers? / Don’t you have slippers? = Don’t you have slippers (or something)? = Do you have a girlfriend (or something)? = Shiken benkyou toka shiteiru? = Are you studying for the exams (or something)? = Thank you, Ella Sensei! = “Toka” no tsukaikata wakarimashitaka? = Do you know how to use “toka” now? =Komento ran to ka Twitter toka tsukatte renshuu shite mitene. = Use the comment sections or Twitter and practice, OK? Hi Maggie-Sensei, I have three questions. I tried composing a sentence about some examples of Canadian sweets using とか, but I wonder if I did it correctly. 1) Can とか and や be used if we list more than two nouns or adjectives, or are they only used after two instances? 2) Can additional particles like も come after とか as in my above sentence? 3) If I’m writing to a penpal I have spoken to in years, and want to be polite and write formally, should I use や instead? If I’m talking to people I don’t know on the street (of any age) would I use とか or would it be too casual with strangers? You see some people connect three things in casual speech/writing but if it is more than four, I think it is too much. 3) や is more formal than とか. Unless you are in formal business situation, you can use とか when you talk to a stranger. 1, does this sound natural? 2, Should I use “か” for the meaning “OR” in formal speech or casual speech or both of them? 1. In casual conversation, it might be possible but I wouldn’t say it’s natural. There are too many か in one sentence. 2. You can use か in formal writing. You also use または in formal Japanese. There was meaning other than “Daradara” or “shy”! is it correct? can you please explain the とか usage in this sentence and the overall meaning? thanks in advance! とか in that sentence means is (besides/other than) 「ダラダラ」 and 「照れ」, etc. May I use たり　for this sentence ? Yes, you can use たり in that sentence. 引くとか／聞くとか: connecting two noun form verb. You could look up a dictionary or ask Maggie. Here is ringo and orange. My question is if や is still possible for listing up 3, 4,5 things? Or ya is limited to 2 things only. や is “A, B and etc. ” so it implies there are other things you like. My heart will still be frozen , except for reading your comment. Just one more point about や　and と、 hope you will help me. My understand is the meaning of と　is “And”. And meaning of や and とか are “OR”. Is it correct? That point is very important to me. Because in computing, the AND and the OR is completely different @@. A and B. (Nothing else) →AとB. Obviously また is being used as and here (can’t remember rest of sentence but it’s saying hot and ice coffee both ok for set drink). Why is また being used here and when else is it used to mean “and”? Ahh, thank you for the correction. If you can use か, why is また being used? Is it more formal? Thanks again. Is it possible to use とか with verbs in the たい form? OK, it is possible to use とか with Vたい when you list up someone’s quotes. He always tells me that he wants to see me or he wants to be with me and so on. = My children bothers me in summer saying they want to go to the swimming pool or go camping and so on. As for your friend’s line, I need to know more context but from just that line but it sounds like one of the colloquial usages. It sounds like you have been telling your friend that you want to see her/him. Could you please clarify something for me? You can’t use とか with people right? As in, when someone asked for example “Who could I ask to help me with x?” you couldn’t say something like “AさんとかBさんとかを頼んで” if you wanted to answer “Ask someone like A-san or B-san”, is that correct? Or is that maybe possible? Yes, you can use とか with people. As for your example sentence, AさんとかBさん（とか）　it is very conversational but you can use とか as well. Sorry that this isn’t exactly related to this specific lesson; I was going to ask this question on another lesson but I’ve had a problem with my screen tuning blue on your website. Anyways, how would you translate these lines? My problem was mainly how to translate the そこもっと. I translated そこ as that, which my dictionary said was technically correct, but I’m not sure if what I have is the intended meaning? Hello, it is a line from an anime? I will just help you the part you don’t get. Just tell them* about that more. It’s from a song. Actually, I’m trying to translate it for my Youtube channel – is it okay if I post that line that you translated? I’ll give you credit, of course. Okay, that makes more sense! For future reference, how could you tell that もっと went with 言っちゃって? I had thought that the 精神性 part meant that the person had a spiritual short circuit, as in there is something wrong with their spirituality. Does that sound correct to you? Does that mean:Is this a bear?I like its color.._.._ whats the function of toka? The actual meaning of 色使い is “use of color” but as you translated the color is just fine. But it is hard to say without knowing the context. B: こことか、あそことか探した？ Did you look here or there and so on? the weather forcast said its going to rain tomorrow,so how about we go a place wheres there no rain.__….Hmmmmm._.._like my apartment or the movie theaters? Note: 行ってはどうですか？means “Why don’t you go to ~ ?” and the speaker is not involved. 行きませんか？ / (casual) 行かない？ would be better. Thank you so much.._.._i appreciate it. Your explanations are too perfect! 1. About とか and やら. Q: This これは is linked to 「ＡやらＢやら」 or to 「～とか～とか」? Additional inf. やら is often used to describe some different things, feelings get all mixed up. Also it is often used to show your negative emotions. 2. We do use やいなや to describe your own actions as your example sentences. But you have to see the second action objectively. The verb (B) can’t be volitional or assumption. This was considered as the wrong one. Maybe in the second part of the sentence must be something which cannot be controlled by the speaker? Because 貯金します means I will save that money. You are showing your will. So it will be volitional. Mhmm, I see. Very good! I really like your positive attitude! Hello マギー, long to no see, how have you been? Today during my grammar studies I came across a very interesting construction, namely 動詞…や…動詞の. 1. This pattern combines sometimes with imperative form of a verb (EX. 飲めや歌えの忘年会) and sometimes with the dictionary form (EX. 殴るや蹴るの暴行). The question is, if the are any rules, or can I combine them as I want? 2. My book says that this pattern 「慣用語を作りますが、そのまま語彙として覚えた方がいいでしょう。」 but gives only a few examples, such as 食うや食わずの／飲めや騒げの／一度や二度の／殴るや蹴るの. Could you make up more examples for me, please? 3. Please check my translations. !! If you have a translation that fits better than mine, then please correct it. !! to describe some extreme situations or commotions using the main actions. As your book says, this patten is usually used in a set phrase and you don’t just combine random words. 4.Translation: Your translation is just fine. It seemed like the year end party turned out to be a blast. Everybody sang and danced and they all had a good time. Thank you very much Maggie! This pattern is now marked as completed. Today I also completed が故に、もの故に and 故あって. I am always proud of you! Thank you for your nice comment!! I’ll do my best making more and more lessons for everyone! (1) and/or (2) etc (3) somewhere like..
Is it alright to use など after たり form? However, I would say if you don’t use V+こと form , it is possible to use たり with など in conversation. It means that Thorin and others which are called heroes…? A hero called something like Thorin. It seems like there isn’t anything wrong… Guess I am just not sure if とか is the best choice here. Welcome back to this lesson. Did you make this sentence? 税金が高いとか、〜 to emphasizes the tax. So I was unsure if it was because toka was incorrect or just her personal preference, hahaha. You use し when you simply connect more than two things or when you emphasize the reason more. Since your sentence simply giving some examples of your concerns, とか works fine. The sentence is very conversational but very natural. Hello Maggie-sensei! How are you? I hope you are fine. I just have a question about “toka” usage. How was is used in this kind of sentence? Thank you so much, Maggie-sensei! Hello, Ritsuko!! I’m good! Thank you for asking! Do you sometimes go to Japan or something? but by using とか, it soften the question. It is a very colloquial usage. Young people especially tend to use this kind of とか (=toka). oooooh! I see! That’s why. Thank you so much for all the help Maggie-sensei! Honestly, ever since I knew about your site, I have been improving on self-studying about the Japanese language! I have been taking notes all the time! I hope you’ll love and continue what you’re doing! I’m very glad!! Thank you so much Maggie-sensei! Why do you use 聴く instead of 聞く? Is it by choice or is it wrong to use 聞く? Can I use と and など together instead of using や or it always has to be や and など? 1) 聞く is the most general kanji and you can write 聞く. But it is more common to use the kanji 聴く for the music. →When you hear something (naturally/ happened to hear something) you use the kanji, 聞く and when you listen to something/someone carefully, such as music, lecture or some audio books, etc. you use 聴く. 2) など has a meaning of “etc.” and you use と for something specific. Therefore AとBなど sounds a little strange.